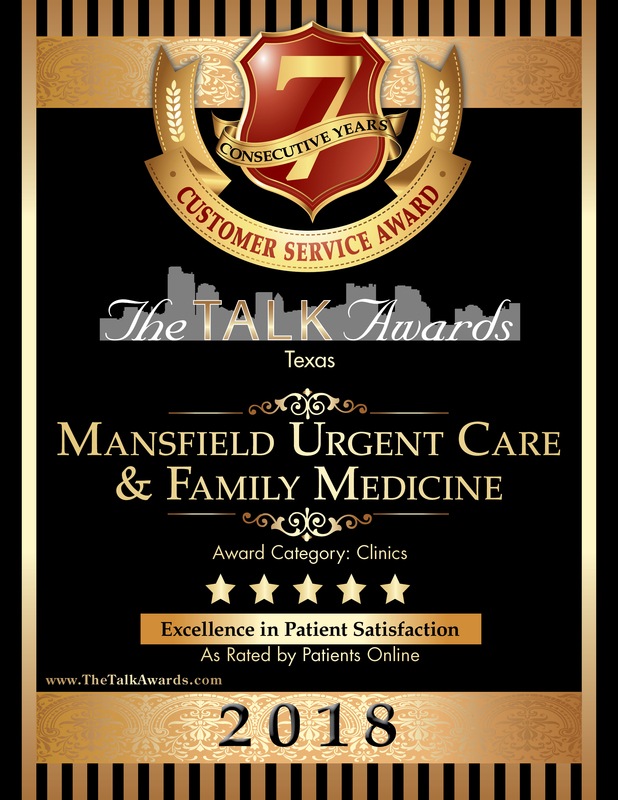 2018 Talk Award winner, Mansfield Urgent Care & Family Medicine, is all about the patient – from the waiting room to the exam room to the complex details in between. 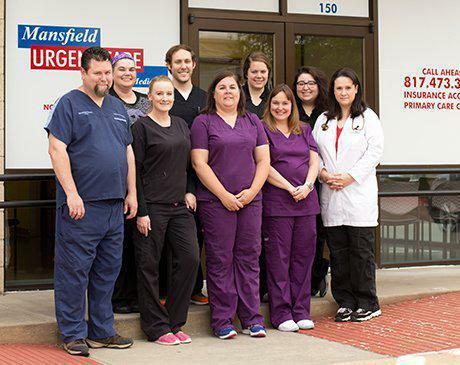 Mansfield Urgent Care evolves with patients by incorporating features like online scheduling, same-day and walk-in appointments, an in-house lab, and extended hours backed by quality care, short wait times, and insurance troubleshooting. Their patient-focused practice earned MUC the 2018 Talk Award for excellence in customer service for the seventh consecutive year with a five out of five-star rating. This prestigious award identifies businesses who deliver great customer experiences based on independent market research using a proprietary rating algorithm which neutralizes bias. With a full team of healthcare professionals directed by Dr. Jeffrey James Fisher, MUC’s business model blends the intimacy of family practice with the practicality of urgent care. Fractures, cuts, colds, ear infections, strep throat, and flu can all be diagnosed and treated quickly when patients need a medical professional immediately through the Urgent Care team. The Family Medicine team at MUC is dedicated to disease prevention. “These professionals dedicate their careers to improving patient health and wellness, and to stopping disease before it dramatically impacts a patient’s quality of life,” explains Dr. Fisher. Because they are credentialed as a primary care and family practice facility with most insurances, patients avoid the high-cost urgent care copay while enjoying consistency of care with a medical team they know and trust. A long-term relationship with a primary care physician can lower health costs, help better manage chronic conditions, and decrease emergency room and hospital visits. MUC’s primary care doctors know a patient’s medical background, treatment goals and family dynamics so they can focus on efficient diagnosis, treatment, and prevention with compassion and expertise. MUC’s Primary Care team acts as an anchor coordinating patient care across all specialties, managing medication and prescriptions, and diagnosing and treating all conditions. Annual physical exams and biometric screenings are an integral part of health and wellness. While patients may often see their doctors for intermittent health concerns, an annual physical allows time to consider a patient’s health from the perspective of prevention, early detection, and patient education. In addition, MUC specializes in women’s health, immunizations for children six months and older, allergy relief, and suture and laceration repair. Patients who find themselves with the flu or a sprained ankle understand the value of immediate treatment without the expense of an emergency room. MUC’s Urgent Care team fills the gap between life-threatening and schedule-ahead care by providing prompt treatment for non-life-threatening conditions. MUC offers urgent care services on a walk-in basis with a call-ahead policy for established patients who prefer to wait in the comfort of their homes. 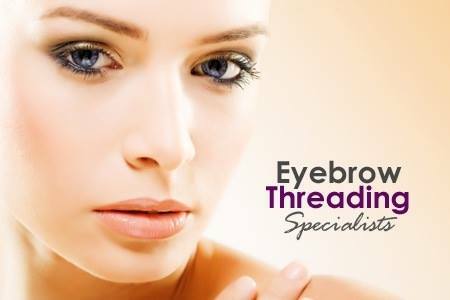 When life doesn’t go as expected and there is a cut that requires stitches, it’s important to find a doctor experienced in suturing wounds who can limit discomfort, stop bleeding, and prevent unsightly scarring while they repair a wound. The team at MUC also has extensive experience in laceration repair. MUC is connected to patients and the greater community online 24/7/365. Their Facebook page features links to blogs on topics ranging from general wellness to nutrition to heart health. Practitioners provide online readers with FAQs and information through “quick tips” on topics like how to treat minor cuts and abrasions, snake bit protocols, West Nile Virus prevention, and immunization scheduling along with benefits coordination reminders, pharmacy contact information, and insurance logistics strategies. The Talk Awards are presented by The Research Company, an independent research and publishing company that calculates customer satisfaction ratings through comprehensive, accurate research for small-to-medium-sized businesses from a broad range of industries. A fair and unbiased rating system combines data collected from online sources – customer reviews, surveys, blogs, social networks, business-rating services – to determine top consumer-rated businesses. Only the highest rated businesses earn the Talk Award. The goal is to help businesses gain control of their image and reputation by providing consumers with a fair and unbiased, third-party overview of their business. For more information about The Talk Awards, call 877.712.4758 or log onto www.thetalkawards.com. Mansfield Urgent Care & Family Medicine is located at 1811 Highway 287 North, Suite 150 in Mansfield, Texas and is open for patient care Monday through Friday from 8:30 a.m. to 8:00 p.m. and Saturdays from 8:30 a.m. to 6:00 p.m. Request an appointment at 817.473.3979 or www.mansfieldurgentcare.com. Find them on Facebook where you can get directions to the clinic or send an online message. In addition, visit their Talk Award page.